Gain access to an array of helicopter applications in the collection of imagery and video for aerial photography, videography, and surveying pursuits. Local Michigan providers and experienced cinematography pilots possess the know-how to deliver a quality result that exceeds the expectations of clients every time, regardless of the project's complexities or size and scale of the task. As a leader in reserving helicopter support in Michigan, FairLifts sources suitable operators and pilots who apply their expertise in operating innovative image and data collection technologies to meet the requirements of client’s projects per their individual specifications. Helicopters are inherently more maneuverable then fixed-wing aircraft and can fly at slower speeds, stop on a dime, and easily vacillate between elevations which results in a more accurate and visually captivating result. This makes them ideal for the purpose of data and image acquisition. Helicopters are also an advantageous resource because they can deliver a more extensive viewpoint and can travel to remote or impassable destinations to collect images, video and perform surveys and inspections. From contracting aerial cinematography services to feature Michigan's busiest cityscapes or the expanse of one of the nation's largest lakes to be seen in motion pictures, to procuring imagery of large-scale properties to make real estate listings pop, reservations for helicopter support across Michigan have increased as of late. Local operators use helicopters because they are often the most revolutionary means of capturing dynamic footage available. Beyond their efficiency, helicopter's inherent capabilities make them unequaled in the collection of imagery, especially in high profile locations or over impassable or isolated regions. Like the aforementioned real estate marketing photos and/or video to demonstrate the actual size of a property, or to really highlight the areas that the property possesses that are astonishing and unique, helicopter applications are the fastest, most accurate and reliable means of obtaining that grade of footage. Or, in the collection of imagery to indicate to investors precisely what stage of development their construction project is in and for film production, helicopters have proven advantageous in getting just the right shot to translate a filmmaker's message to the big screen or in post-production and editing which may require additional footage or reshoots, they have been integral. There may also be times when the expanse of Michigan's Great Lake needs to be searched by law enforcement to rescue stranded boaters or fisherman off of damaged crafts. Additionally, for the unique wildlife native to Michigan, it's imperative for the DNR to know which bird species, four-footed counterparts, and even predators are migrating into or away from the area. These movements can be easily ascertained and mapped via aerial surveying and site inspections of forestry and public properties. There's no limit to the range of industries and businesses that could benefit from aerial image collection throughout Michigan and beyond. Helicopter support has been proven to be invaluable in pursuit of aerial imagery throughout Michigan and her neighboring communities. Land and property surveys, large-scale and high-end real estate listings, utility installation mapping, and site inspections, wildlife population studies, and land demarcations can only be made even more streamlined and professionally facilitated when coordinated through FairLifts. Helicopters improve the quality of the image collection process not only because of their maneuverability which guarantees innovative and compelling cinematography but also because they can hover, alternate between elevations and travel into remote locations. Additionally, helicopters can be fitted with the newest in HD camera technologies and stabilization systems operated by industry professionals resulting in footage that is visually stunning, crisp and fine-tuned. Aerial surveying in Michigan is used across a range of industrial applications. From mineral exploration to the survey and inspection of vital resource pipelines, helicopters deliver a stabilized platform from which to gather and record important information. Helicopters are used alongside lasered technologies to isolate problem areas, map boundaries, check for easement and ROW compliances, and to look for leak signatures that could indicate a potentially harmful leak or fracture. Helicopters inherent ability to fly rapidly, land anywhere and take off easily from precisely the same spot, deftly maneuver through heavily populated and towering cityscapes and in isolated regions make them a vital resource to law enforcement. Emergency services throughout Michigan's communities also use helicopters for firefighting, Search and Rescue Ops and as a safer alternative during suspect pursuits. Helicopters are used to conduct aerial monitoring of Michigan’s indigenous wildlife and in enumerating population counts. Flyovers are conducted to collect imagery via cameras, video or using sensors to determine population counts or to track predators within a specified area. Beyond simply collecting information to draw comparisons between ground and aerial counts, the aerial census is an important resource in wildlife conservation as well. FairLifts account managers source suitable alternatives to help you get your projects completed successfully. 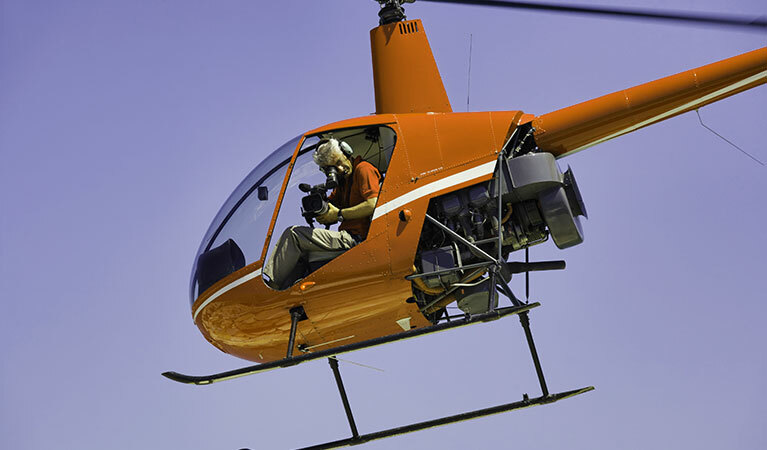 We work alongside experienced vendors and seasoned film pilots and crew situated throughout Michigan who are proficient in the operation of helicopter aircraft and aerial photogrammetry technologies. Agents are available 24/7 to talk project specifics with you. Hear complimentary price quotes and service-centric details when you call to reserve aerial imagery and survey services through FairLifts. The reservation process is simple, complete the contact form on our website or reach out to us by phone. We are waiting to speak to you.